Floating ceilings inspire great spaces by introducing new shapes and add depth, scale and rhythm to internal areas, creating a contemporary aesthetic for modern building designers in the transport, education, commercial and retail sectors. But the 56-page A4 guide also explains that canopies and baffles can help create a more sustainable interior, contributing to improved indoor air quality and acoustics, and supporting high-mass, low-energy construction. All this in a peerless variety of colours, effects including wood, and materials including mineral and metal, as well as shapes including square, rectangular, circular, concave, convex and curved. Floating ceilings are also ideal for the easy integration of building services such as lighting and cooling and heating elements. Floating ceilings are capable of providing greater acoustic sound absorption than continuous ones because all their faces and edges are exposed, and because they are easily relocatable are as suitable for retrofit and refurbishment as they are for new-build. In addition, specially-engineered surfaces reflect up to 87% of light to improve illumination, making spaces brighter and more comfortable and cutting energy bills. They are additionally sustainable in that they are manufactured from a high degree of recycled material and are also recyclable. The brochure also explains how product variety is backed by service support including consultations with specifiers or main contractors, supply of BIM and production of CAD drawings bespoke to the project which are then used to engineer a production schedule and logistics plan, and on-site guidance and post-installation review if required. 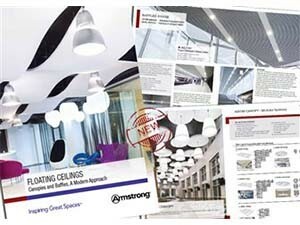 Armstrong’s new floating ceilings brochure is available to download from http://www.armstrong.co.uk/assets/global/commclgeu/files/Literature/3514.PDF and via the Armstrong Ceiling Systems App available from both the Apple store as well as the Google Play store, or by clicking on one of the links below with your mobile device www.armstrong.com/CeilingDownloads-Apple or www.armstrong.com/CeilingDownloads-Android.